The "Self-Taught Musical" is a compilation of songs that are based on Ibn-Tufail's text "Hayy ibn Yaqdhan" , a classic of medieval Islamic philosophy. It's the story of Hayy, a boy being raised by a doe on an uninhabited tropical island. When the doe passes away, Hayy's life unfolds from one of dependency to one of exploration and discovery. He starts with dissecting his mother in order to find out where life comes from. Over the years he grows up to discover the truth about the world and his own place in it, unaided but also unimpeded by society, language, or tradition. Teach yourself how to be! The musical�is the framework of several artist's contributions such as songs, videos, lectures that deal with the idea of self-teaching and survival attitudes. 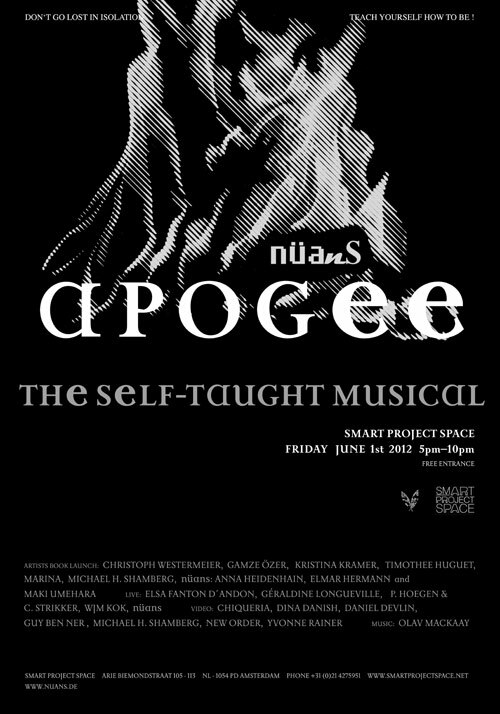 The whole event is related to the book "APOGEE- a compilation of solitude, ecology and recreation" (revolver publishers, 2011) edited by artist group nüans. Discover the fire of life!